Rabbi Avraham Zeida Heller was born in Safed on Jan. 25, 1984, the fourth generation of his family in this city. He was the great grandson of Rabbi Shmuel Heller, a 19th century Safed rabbi, and a descendant of the famed Rabbi Yomtov Lippman Heller. After attending Heder (Jewish parochial school), Avraham Heller learned in the Yeshiva (seminary) of the Ridbaz (Rabbi Yaakov Dovid Wilovsky, who was known by his acronym) and also attended the Yeshiva known as the Beit Chatam Sofer in Safed. Rabbi Heller received his ordination from Rabbi Avraham Yitzchak HaCohen Kook (first Ashkenazi Chief Rabbi during the British Mandate in Palestine) and from other central rabbinic figures with whom he initiated dialogue on a number of important Jewish legal issues culled from both the Written and Oral Torah. In 1914 Rabbi Heller married Frieda Barzel and the couple had five daughters. It was Rabbi Heller's father Zeev who was responsible for establishing the Yeshivat Chatam Sofer in Safed. When Zeev passed away in the year 1919, Avraham Zeida combined two Yeshivot, the Ridbaz Yeshiva and the Chatam Sofer, creating the Yeshivat Chatam Sofer-Ridbaz. Rabbi Avraham Heller was appointed as the head of this learning institution, or Rosh Yeshiva. 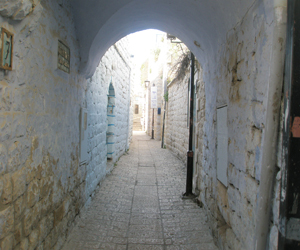 In addition to his work at the Yeshiva, Rabbi Heller set aside time to serve the people of Safed in a variety of ways, such as volunteering his time to establish the neighborhood known as Tzofia, on Har Canaan, and founding and standing at the head of a branch of the Mizrachi (Religious Zionist) Movement in Safed. Through his work in Mizrachi, he influenced the Safed community to greater activism within this organization. Heller was also involved in organizing the Hagana, the fledgling Jewish defense force, raising funds for the purchase of firearms. Rabbi Heller received a prize from the Hagana for his service to this cause. During the War of Independence, Rabbi Heller stood at the head of the Homefront Command and of the local draft board where he fought against draft evasion even as families of draft evaders sent him death threats. During this time, Rabbi Heller entered the public conscious and won broad consensus with his Jewish legal precedents on waiving the observance of commandments in order to save lives. In March of 1938, while on his way from Haifa to Safed, Rabbi Heller's taxicab was attacked by a gang of Arab bandits, close to the village of Shazur. Heller, by dint of what seemed a miracle, was the only one saved among the passengers, victims of the cruelest type of slaughter. After Israel's War of Independence, Rabbi Heller stood at the head of the Safed religious council, while continuing to manage the Yeshiva. He also published many books and articles. His major work, "The Rabbi, the Leader, and the Doctor," was a biography of his great grandfather, Rabbi Shmuel Heller (1989). Avraham Heller received a medal honoring him as a Defender of Safed, from the former commander of the Palmach, Yigal Alon. At the end of his life, Rabbi Heller lived in Central Israel but asked to be buried in the beloved city of his birth, Safed. Avraham Heller passed away on the 4th of the Hebrew month of Tevet 5751 (December 22, 1990) at the ripe old age of 96. Hundreds of Safed residents, most of them veteran fighters from the Hagana and the IZL, accompanied him to his final resting place in heavy rains to the old cemetery of Safed where he was buried near his ancestors. The mayor of Safed at that time, Zeev Pearl, eulogized Rabbi Heller, stating that he was, "among the heroes and the defenders of the city." Avraham Zeidah Heller was a symbol of tolerance and respect, and always had an ear for his fellow man. He received the posthumous appellation Yakir (Beloved) of Safed, in 2003.